The fence above is a semi-privacy fence in white Basketweave and stands 5’h. Every third section is stepped down from top of retaining wall to ground level. Posts are 5”x5” and include New England post caps. 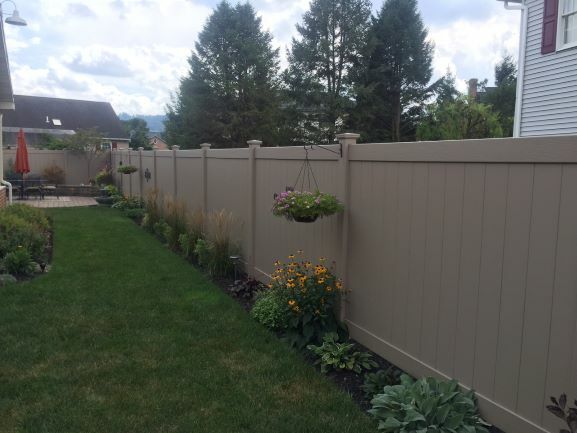 This is the Certagrain Chesterfield privacy fence in Natural Clay. Fence is 6’h and includes an angled section (not pictured) to join an existing 5’h vinyl fence. Posts measure 5”x5” and include matching New England caps. Click the catalog link for Certainteed on our Fence Vendors page for more information. Sections come in standard 8’ lengths and arrive un-assembled, making them easy to load and transport. Repair or replace an individual piece of fence if it gets damaged without replacing the entire section. Many styles of vinyl fences meet pool code requirements and offer pool code compliant hinges and latches. Rounded corner sections can be added to follow a pools rounded shape while swoops and S-curves can be added to join two fences of varying heights. Some styles of vinyl fences are rated to withstand wind loads up to 115 mph. 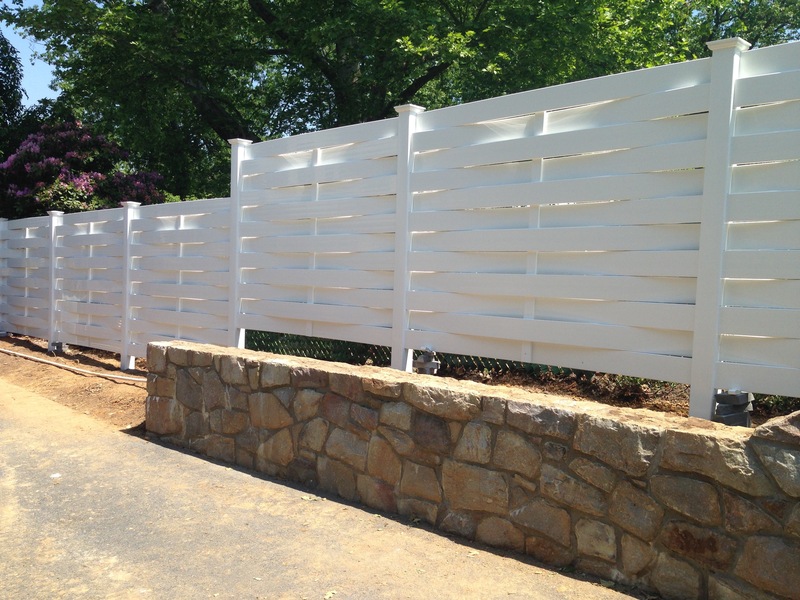 Vinyl fences have a greater variety in picket spacing options. Adding a topper- Avoid the solid wall effect in a privacy fence by adding a lattice, aluminum or other decorative topper to the top foot of the fence. It lets a privacy fence have a more open, neighborly feel. Distinguish the gate- Add a decorative topper or arch to the tops of gates to set them apart from the rest of the fence. Lighting and post caps- Add a decorative vinyl post cap to dress up a plain vinyl fence or add low-voltage/ solar caps to gate posts to safely guide visitors through gates at night. Low-voltage and solar caps are also often used along the fence line to highlight landscaping features at night. Go two-tone- Break up the solid wall effect privacy fences can sometimes have by choosing a different color for pickets. One popular choice is installing a fence with white framework and posts but with tan interior pickets. Puppy-proof an existing vinyl fence- If you’ve recently brought home a furry friend and are finding they can wiggle through your existing vinyl fence, adding weld wire using vinyl clips or lattice to the lower portion of your fence might be a good temporary fix until your puppy is grown. Adding an arch makes a gate stand out in a long fence run. Homeowners also choose to add a decorative Gothic post cap to this 4'High Deluxe picket fence with 1/2" square pickets.